woohoo - I share your excitement, nothing better than seeing a beautiful loaf of bread that you made yourself! stop, just stop right now...you are going to cause me to want to make bread with these beautiful loaves of yours - its too hot to fire up the oven! OMG that baguette looks so crispy I could eat it alone!!! Your bread-making skills really are progressing - I'm impressed and envious. I still haven't tried doing sourdough again, not since I had to throw away the big glass jar because the black crust was creeping over the sides... Lesson? Manage your starter or it will manage your kitchen! Lisa, you have done a GREAT job! 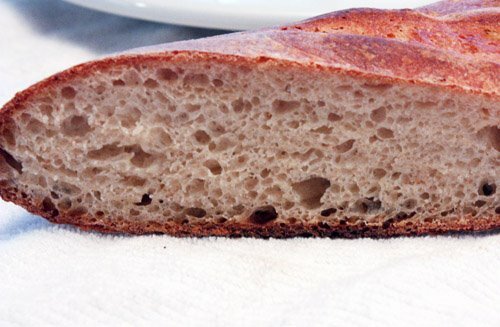 I've always wanted to makes my own sourdough bread, but I wasn't always sure what ingredients were in them. I'll keep this starter in mind. It would definitely help a lot!! Your sourdough looks amazing!!! I wish I wasnt too lazy to try making my own! I love bread with lots of holes! Looks so amazing. Wow Lisa, you really beat me here. I still haven't tried my hands on baguette. Well done. Love the crumb! I've been looking for a baguette recipe. Thanks! Quite a perfect crust. Just the kind of baguette to slide in a paper bag and trot off to work with. Mmmmm. These look perfect! You did a great job! Sourdough is one of those things that I am still afraid of trying. Maybe I'll man up before the year ends, LOL. Your sourdough baguettes are picture perfect. I am so impressed that you made these. I swear, they look as good as those at the finest French bakeries. wow, that crumb is amazing. Great job! I am so impressed by your skills! I love to eat only sourdough bread but I have never made it before myself!! You did an excellent job! Perfect baguettes! I wish I know how to make one. I'm sure it has a wonderful smell in the whole house while baking. Even that smell is enough to get excited. Looks great! Lisa, bravo...the bread looks wonderful. I wish I could smell it as it baked. It looks amazing with that jelly! Perfect bread and perfect descriptions. My birthday is at the end of this month and I am compiling a list of the things I would like to accomplish in the coming year. Sourdough starter is one. This is gorgeous! 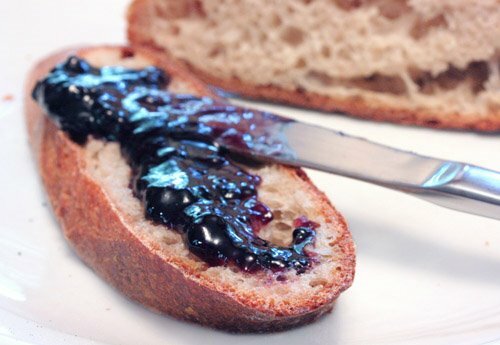 I particularly like the shots of the crumb and of the bread smeared with jam. Now I'm hungry! I think you stood up well to the challenge! I never get these things scored correctly - even when I use my extremely sharp straight razor (that I use for shaving). I have been told on good authority by Joe, of joepastry.com, that a serrated shun utility knife he has it better than any professional lame he's used. Still haven't tried it myself. I have the la brea bakery book and I've been to intimidated to use it. I think you just talked me into making baguettes. Yours look wonderful! Your baguettes look great! Like Nick I am never satistfied with my scoring even when I use a razor blade. Maybe it is a matter of practice?! But your scoring looks great. Wow. So perfect looking. Great job! This looks fantastic! 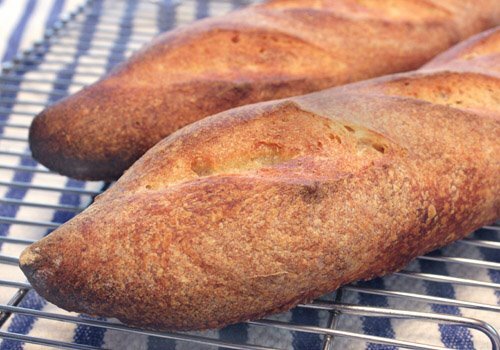 I've just started bread baking and have had some success.I've been looking for a great French baguette recipe. 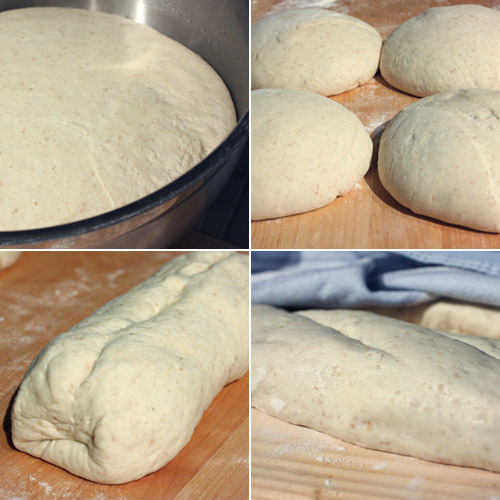 Isn't baking your own bread so satisfying? 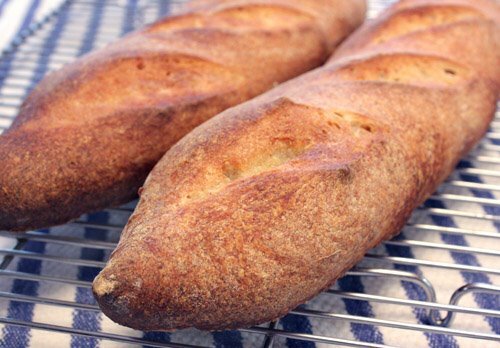 These sourdough baguettes look perfect, right down to the slits on top! I would not have been able to show the restraint you did - one loaf would have been consumed immediately out of the oven! At least, there was another to be photographed! I just started my first sourdough starter yesterday. I am hoping that I have as much as you did. Any tips you can provide for the feedings, etc?